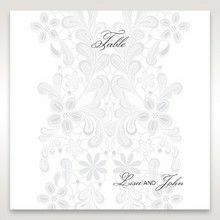 This beautiful classically designed invite is perfect for any couple embracing a romantic traditionally styled wedding. 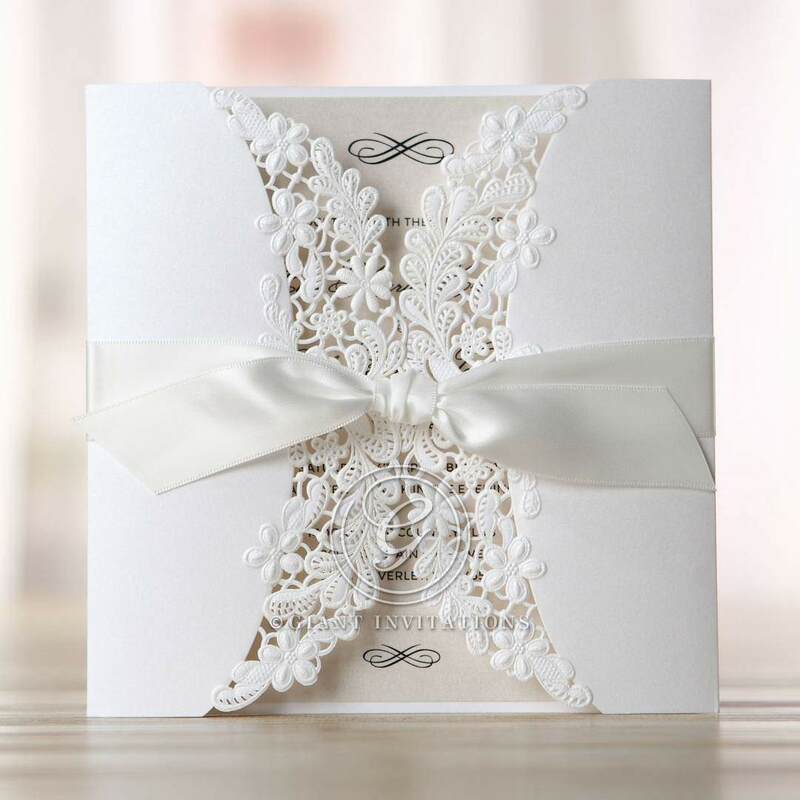 Featuring delicate laser cut detailing, pearl paper stock and a perfectly placed ribbon for the ideal finishing touch this invitation has a range of advanced techniques applied. 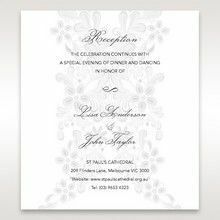 The use of thermographic printing gives the invite a raised ink effect depicting an elegant timeless appeal. I just received this sample invitation and it is absolutely stunning. It is classic elegance, really beautiful and it perfectly matches our theme for the day and what we had in mind for our invitations and we are very excited to use this as our invitation for the big day. The ordering process was really easy and I received it within a few days so I would highly recommend using Giant Invitations. They have so many different designs to suit every wedding style. 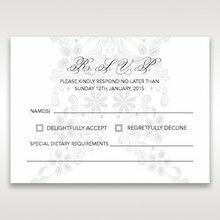 Also, if you decide to use their design you will have the fee paid for the sample(s) credited when ordering your invitations, which is amazing. They could't have been any better they were beautiful, I was very impressed when I received them. They had a tracker put on as well so you could see where they were at all times and a text message to let you know the day they were arriving. Thank you so much Giant Invitations, Would highly recommend to everyone who is getting married, You cant go wrong they are the first things your guest see and they are stunning. 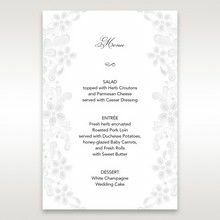 After scouring the internet for a long time, I found Giant Invitations to have the nicest designs, easiest interface, and best value. A close friend ordered her invitations through Giant Invitations and the quality is lovely. The card has the perfect weight and the invitation paper is beautiful. I have no hesitation in recommending Giant Invitations to anyone wanting fantastic quality and value for money. 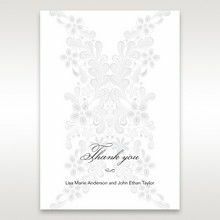 We ordered samples of the Enchanting Ivory Laser Cut Floral WrapHB11646 invitation to view before the wedding. Have to say and to our surprise, the card is Divine! The quality of the card is very high, the size is just perfect, then there is the whole presentation of the card! The font used is lovely, how it all comes together is simply a stunning package. These cards add a touch of class to the wedding! I found there customer service to be really helpful and informative. There was a really good range of invitations to fit everyones budget. There was a wide selection of invitations and there seemed to have new arrivals of invitations all the time which was great. 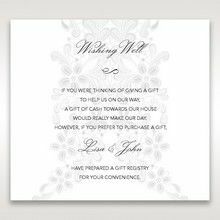 I would recommend there store to any of my friends or family in need of nice elegant invitations. I was overall very happy with there products. These invites are absolutely beautiful. The detail is so pretty and I had so many comments on what nice invites they were (along with the matching items). Very elegant design (I ordered designer's recommended font/colours etc, as is). The embossed detail/paper definitely makes this stand out from other invites, and the choice of personalising the stationary is even better! !Very happy with them indeed!!!! Fantastic! !Quality of invitations is outstanding. I ordered the Enchanting Ivory Laser Cut Floral Wrap and they most definitely met my expectations, they look stunning. Will order through Giant Invitations again. Beautiful invitation that I have received for my friends wedding. It was magical and exciting to hold and open it. 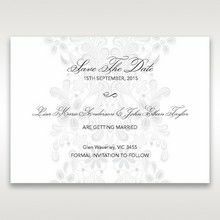 The invitations were stunning, classic and elegant, exactly what I was looking for. 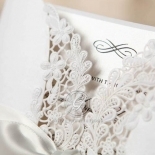 Beautiful wedding invitaiton! One of our favourites. Just about to put my order in! Oh, and great customer service! I ordered 5 samples and the quality and service was fantastic. They are all so beautiful! I used these for my wedding invitations and both the price, and the style is fantastic. They have a pretty gloss finish, which I loved and Giant Invitations did a great job of adapting the text I wanted to look beautiful. I have already recommended this company to a friend. Quality product, prompt service, excellent range and choice options. Quick access to customer service support for any questions. 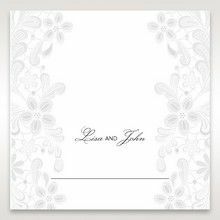 I will be ordering these beautiful wedding invitations, I ordered 6 samples, the hardest part was deciding on which one they were all so beautiful ! I'd highly recommend these invites. Lovely presentation and also GREAT customer service! Giant invites is always there to answer any questions ! The service is fantastic and prompt and the invites are of exceptional quality with reasonable pricing! Will definitely refer others! Absolutely beautiful Invitations - they are so classic and elegant, and I am so happy that I chose these for my wedding! I ordered sample wedding invitations - they arrived the very next day and were stunning ! I am so happy to have these wonderful invitations. The invitations were just like the picture! Very pleased with the two samples I ordered and will be purchasing my wedding invitations also! Ordered a sample of this invitation - it is such a timeless and classic design; I really loved it. Stunning invitation. Simple yet so elegant. Will definitely order for my invitations! I ordered samples from this website and a few others. The quality of the materials and printing from Giant invitations was incomparable to the others. I can't wait to order mine from here ... the hard part is selecting which beautiful design I want. I just may have to visit their showroom! The invitations I received looked great, they are just as beautiful as the picture,However afternoon was spelt Arfternoon on the invitations that were sent to my guests. I felt partly responsible as you are meant to proof read the draft but I honestly just checked the spelling of names and checked times were correct. I received the invitations today and I am grateful.They are everything I expected and more (elegant/classy/quality) - I love them! Once again, to all the team at Giant Invitations, thank you so much for all your great work and efficiency. The sample I have received was very high quality! 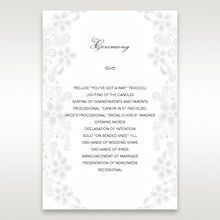 I love the pearl white card you have used, along with the metallic insert.I intend on ordering these for our wedding and think our guests will love the simple and elegant design! I just want to say a huge thank you for all your help. The invitations are amazing and we are so happy with the quality. The customer service was brilliant and you were extra helpful in getting the order processed straight away. We would definitely order through Giant Invitations again and would highly recommend you for quality invitations. I have received the laser cut card, ribbon, stickers and envelopes and love them! Your service has made the ordering process so easy and your turnaround time is great! !Appreciate all your assistance. Thank you once again! 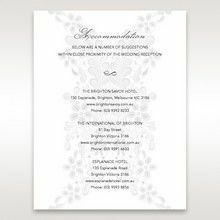 What a beautiful card, Giant Invitation is very professional, excellent customers service, my invitation cards were delivered on time. Everyone that received our invitation love the card. Thank you again Giant Invitation Team you make it special for us. My invitations were way beyond my expectations. I love everything about them. The printing, font, style and the thick card stock. I’ve used Giant Invitations in the past and will be returning. Thank you! I was beyond excited to receive my invitations for my upcoming wedding, this design was exactly what I was looking for and the customer service provided to me was amazing! I’ll be recommending Giant Invitations to all my friends and anyone else who asks!